Update (August 23): this no longer works. YouTube's experiments add new features or tweak the interface. Here's an experiment that does something unexpected: it removes the ads. 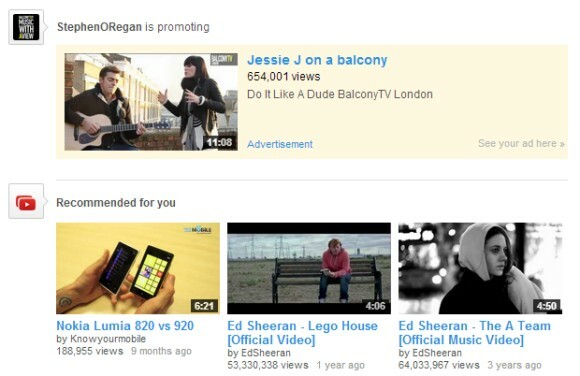 After changing your cookie, you'll no longer see ads on the homepage, in search results, next to YouTube videos. The experiment also adds channel cards when you mouse over YouTube channel links. This also works for the in-stream video ads and the Homepage Roadblock ads. It's not clear why YouTube added this experiment. Maybe they want to see how people use the site if there are no ads. Obviously, there are many ways to hide or remove ads, so if you want to do that, there are better options than relying on an experiment that might no longer work at some point.